I’m trying something new here on the blog. I thought that on the weeks where I have my act together and get a menu plan made, I’d quickly post it here. My hope is that it helps you as you think about meals for your family. Our entire family eats gluten-free at our house. I have found that this is much easier for me than cooking two different meals, and of course, safer for me as I don’t have to worry about cross-contamination. Instead of coming up with all new meals when we went gluten-free, I set about adapting the meals we already enjoyed. With just a few tweaks, you should be able to do the same with many of your family favorite recipes. If you need some help, please feel free to email me any recipes you are having trouble converting. 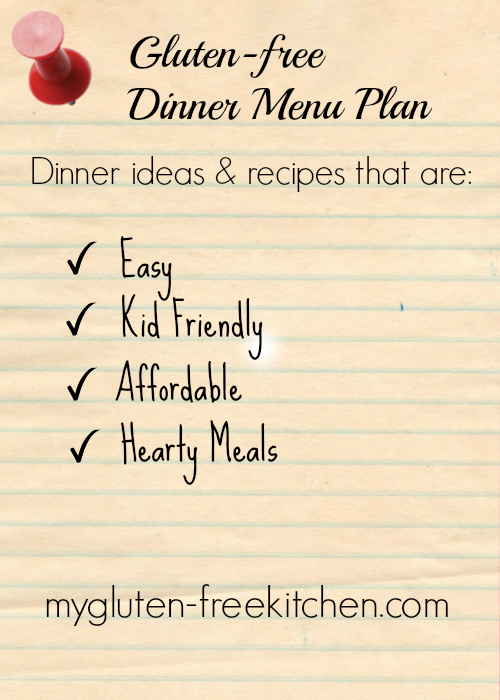 To give you some ideas of simple, affordable, family-friendly meals, I’m going to share my menu plans here occasionally. I’ll link to the recipes that are already on the blog (or on other blogs) and will continue to add new recipes on here so that you can find them all. Please do let me know if this is helpful, or you have any questions! Wednesday: Leftover night plus fresh fruit (if needed, will make hot dogs!) This is our busy night, so I like to keep it easy! I would love to try this, Jeannie. Thanks for offering the menu plan. Oops…jeannie linked to your blog and i got mixed up. Sorry Michelle! Haha, I totally understand Sharon! Thanks for your comment though! I hope the menu plan ideas are helpful! Erica, Glad this was helpful! These all sound delish and great ideas! I would like to learn more about the gluten free way of cooking. Any info would be greatly appreciated.